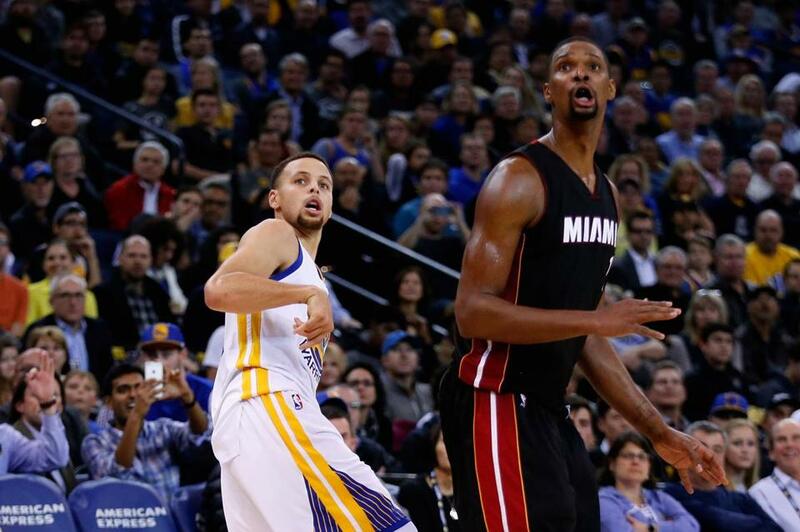 Stephen Curry (left) and Chris Bosh watched a Curry 3-pointer fall into the basket on Jan. 11. October 12, 1979. Opening Night. Boston Celtics vs. Houston Rockets. First quarter. Rockets lead, 17-16. Celtics advance toward the basket. Instead of cutting to the basket, Chris Ford drifts out to the deep right corner. He receives a pass. He sets his feet. He takes a deep breath. For all I know he recites the Villanova fight song (a very nice one, by the way). Without leaving his feet — he and John Lucas are the last of the great one-hand set-shooters — he lets it fly. Swish. But rather than providing the Celtics with a 1-point lead, as would have been the case since the BAA/NBA begun play in 1946, this shot gives Boston a 19-17 lead. For this evening is the official beginning of the rest of the NBA’s life. This is the first night of regular-season play with the 3-point shot. And Chris Ford has just become the first man to benefit from that rule. No one could possibly have imagined Stephen Curry. The night will end with the Celtics victorious by a 114-106 score. The sum total of successful 3-point shots will be two, the other made by Rick Barry. Let’s go to the 1980 All-Star Game at the Cap Centre in Landover, Md. It is a stirring, competitive, fun-filled game that highlights the great talents of the world’s best players. After 51 minutes and 20 seconds of play, the East and West are deadlocked with tie No. 16 at 136. East coach Billy Cunningham would later explain that he wanted Boston rookie Larry Bird on the floor because of his multiple skills, and he is rewarded when the kid takes a pass in the deep left corner and drills a tiebreaking three that propels the East to a 144-136 triumph. All-Star history has been made. It is the first and only successful 3-pointer in the game. For the record, Bird was 1 for 2. No other East player attempted a three. The West was 0 for 4 (Paul Westphal 0 for 2, Jack Sikma 0 for 1, and Magic Johnson 0 for 1). Sounds as if woolly mammoths should have been roaming outside the arena, doesn’t it? The three had been the brainchild of Abe Saperstein, and yes, that would be the same Abe Saperstein who had been the impresario of the Harlem Globetrotters. Abe had founded a league he hoped would challenge the NBA back in 1961. It was called the American Basketball League. The Cleveland owner was a guy named George Steinbrenner, and he made history by hiring an African-American named John McLendon as his head coach. Abe, meanwhile, put in a rule giving someone 3 points for a shot in excess of 25 feet. The reason? “The little man is being forced out of the game and somebody needs to do something,” he explained. Abe’s league folded in the middle of its second season. But his rule lived on when the Eastern Basketball League, the weekend circuit that was the second-best league in the world at a time when there were nine NBA teams and a little more than a hundred jobs, adopted the rule. More importantly, when the American Basketball Association came into being in 1967, its twin signatures were a red, white, and blue basketball and the 3-point shot. The plain truth is that with very few exceptions, the NBA simply did not know what to do with the 3-point shot. Two teams in particular, the Atlanta Hawks and Los Angeles Lakers, acted as if there was something disgusting or unsporting or something about the three. Even our man Larry was surprisingly slow to exploit what was obviously a great potential strength. After going 58 for 143 as a rookie, he made infrequent use of the rule in the next four seasons, going 20 for 74, 11 for 52, 22 for 77, and 18 for 73. He finally began firing away in Year 6, going 56 for 131 in the 1984-85 season. He repeatedly told me how much he disliked the rule. His reasons were twofold. 1. That too many threes were actually ruled twos and vice versa, in his opinion. 2. He didn’t think you should lose to a three if you were ahead by 2. One issue that surfaced quickly was the idea of what to do if you were up by 3 in the waning seconds. It was a hot topic right here on Super Sunday 1980. The Celtics were leading the Sonics by 3 when Dennis Johnson was allowed to snake along the baseline from left to right, curl off a screen, and hit a tying three at or near the buzzer. Seattle won in OT. The next day was the first, but not the last, time we debated the idea of fouling someone deliberately when you were up 3. I must acknowledge it was a debate I had never imagined would take place. Full disclosure: I am no fan of the three. I think it’s the worst rule development of my lifetime. I think we have gone completely 3-point crazy. Believe me, I know how heretical this is. But I believe the game has changed irrevocably because of the three, and not for the better. People argue that it allows comebacks that never would have taken place, absent the three. Well, yeah, so what? To me, it’s all artificial. I think the three distorts the game on every level. But I’m not stupid enough to think the three is going anywhere. It’s here to stay, and the success of the Golden State Warriors means that in this copy-cat world the game will only get more and more 3-point dependent. Nowhere is this more evident than in the All-Star Game. Where as we had six attempts and one make in that inaugural All-Star Game with the three, last year the West beat the East, 163-158, and just less than 51 percent (.506) of the game’s 263 shot attempts were threes. Now we even have a 7-foot-3 inch Latvian named Kristaps Porzingis raining threes in New York. I’m not sure a 7-3 Latvian was what Abe Saperstein had in mind, but it’s too late now.